Graduating from college can be an emotionally-conflicting experience. There are the obvious feelings of accomplishment and triumph. The process of obtaining your college degree likely featured a number of difficult challenges, and you should feel great about your success. However, college grads also can feel anxiety about what’s next in their journey. Our Managing Partner David Sprinkle was recently featured on a news segment to provide job search tips for recent college grads. Among the valuable insights he provided were to know your destination, customize your resume to the job you’re applying to, and to give your social media accounts a thorough makeover. To arm you with more information as you enter into the next chapter of your life, here are some additional career tips. The process of finding your first job out of college can be challenging. College grads are typically selling their potential to employers, rather than their experience. In many ways your first job is the most difficult to land. During the process, try not to get discouraged and do your best to remain patient. You may have to apply to a dozen different jobs and draft a dozen different versions of your resume and cover letter, but with persistence and patience you’ll eventually land the job to launch your career. You meet a lot of people during your undergraduate experience. When you’re searching for your first gig out of school, don’t neglect to utilize your network. Faculty, alumni, classmates, friends and your friends parents. Each member of your network could be the key to unlocking your first job offer. Leverage your network through communication. Let them know what type of work you’re seeking and your employment goals. If they don’t know of any current job openings for you, ask them for tips or advice on how they navigated the early stages of their career. On the journey to earning your degree, you became an expert in studying for exams, researching and drafting papers, and in preparing presentations on projects. Apply what made you successful in college in your pursuit of a job out of college. The key to acing your job interview is in your preparation. Thoroughly research the employer. The more you know about the company, their story, their vision, and their leadership, the more evident it will be to the employer that you want the job. You also want to prepare the questions that you’re going to ask, and the responses you’re going to give. Grab a friend or classmate to practice your interview responses by doing mock interviews with each other. Your work isn’t finished at the end of a job interview. Within a day of completing your job interview, make sure that you follow up with the prospective employer with an email and a hand-written note in the mail. The email is immediate, and the hand-written note shows that you are willing to go the extra step. Both the email and the hand-written note should thank them for their time, restate your interest in the position, and mention a few takeaways from your interview. If there was a moment or two in the interview when you and the interviewer bonded, bring that up in your email and letter. You want the employer to know that you have sincere interest in the job. Employers want to have confidence that a candidate will accept the job if it is offered to them. Your aim during your interview is to project strong and sincere interest in the position, and a follow-up email and follow mailed letter allows you to amplify that interest. You want to make a positive impression with every employer you interact with, as you never know what opportunities may present themselves down the line. By following the tips that we highlighted here, college grads will be well on their way to securing their first job out of school. 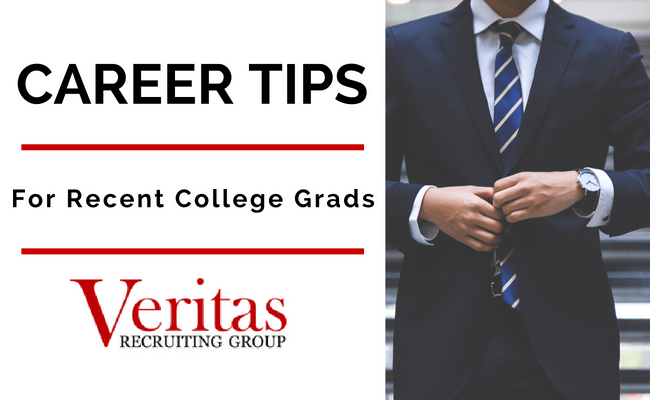 If you’d like to give your job search a boost, consider partnering with a recruiting firm like Veritas. Working with a recruiter allows college grads to gain exposure to a wide number of fantastic companies and job opportunities. Learn more about how Veritas Recruiting Group can help accelerate your job search.